I must confess that my artwork shifts and changes as much as life keeps changing around me. I grew up here in the Willamette Valley and was strongly influenced by my parents love of the natural sciences, art and architecture. My work connects to the forest life and rivers of the Willamette Valley, to native plants and a love of animals. Materials and methods alter depending on what is required for the work. I always end up utilizing a plant based material of some form for my pieces, and yes that often means paper. In 2004, I received an art degree from Western Oregon University where I focused on ceramics and printmaking. Today, printmaking remains in my life but ceramics have taken a back seat to working with paper in different forms. My recent work involves using a variety of paper stretched over wire forms, embellished with wax, copper, and thread. 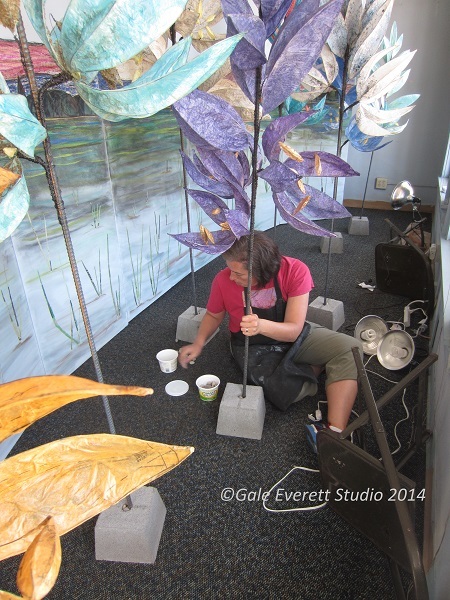 Hand-cut paper botanical lamps also continue to surface at a regular rate. Dogs and a few wild birds have taken over my printing world with block, screen and etching techniques. What kinds of creative projects are you working on right now? At the beginning of September, I completed and installed a work titled Camas currently on view in Halsey Oregon (773 W First Street). It is part of The Arts Center Art in Rural Storefronts Project. This is the third season and my second window. The Halsey work spans almost 20 feet of space in the old 1929 library. 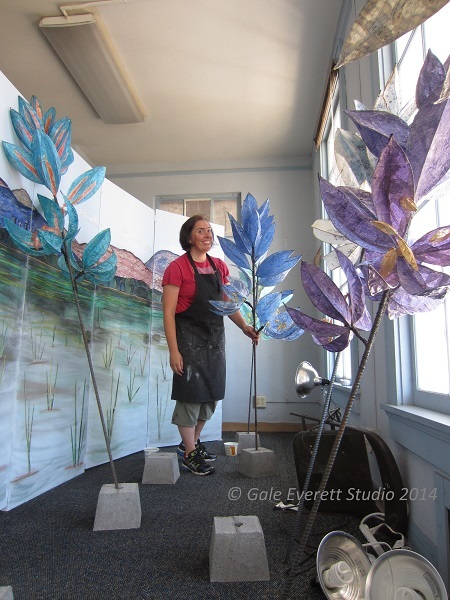 It features 8 paper and wire Camas plants in front of an expansive pastel and paper collage of the coast range. The sculptures, ranging in height between 4 to 6.5 ft, were created from wire covered in book pages, thin paper, and inclusions that reflect different aspects/inspiration of Halsey history. The work is on display until late November 2014. Even before completing the Camas project, my brain had shifted focus onto the next installation dream. You'll have to stay tuned for more information. Otherwise, I'll be continuing with more printmaking ideas and lamps. There's always something brewing in the studio. Nature is the largest inspiration for my work. Everything I create echoes some portion of surrounding life. I'm drawn to native plants and animals, environments, pets and people. There is always a hidden story behind each work, often inspired by life situations, but not one the viewer would recognize unless they happened to know me. What got you interested in art? Have you taken any art classes? Art has been a constant presence throughout my life starting with my family. My father's mother was an artist who worked in a variety of media. I would spend hours with her on weekends, coloring, learning how to crochet and hearing so many stories about her years in art school and beyond. My father was an artist too, focusing on architecture and construction. After retirement, he continued designing and building homes plus focusing on watercolors, furniture building, printmaking, and lost wax casting. My mother's focus was on native plants, birds, and the environment. She dragged me everywhere birding, monitoring elk herds with telemetry, and slogging through dense forests and bogs in search of threatened and endangered plants. Throughout grade school, junior high and high school, I loved art. I learned ceramics, metal working, batik, and calligraphy. Why didn't I enter art school after graduation? Beats me! I held off venturing into the art world for many years until I rediscovered it in 1999. At university my focus was on ceramics and printmaking. I received a BS in Art from Western Oregon University in 2004. Since then, I've worked 9 seasons as an administrative assistant for Corvallis Fall Festival and almost as many years as a volunteer and assistant at The Arts Center of Corvallis. Currently I focus solely on creating and experimenting with my work.